Agavaceae. Zones 8-11. A true agave classic for the South. 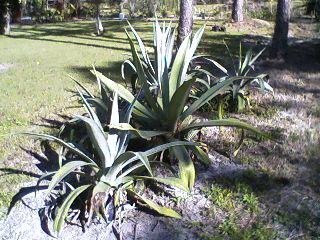 One of the largest agaves when grown in the ground. Displays beautiful arching blue foliage. Can grow to four feet high and wide, offsetting freely. Needs to be sited in a very well-drained spot in full sun. Can be container grown if space allows. Our container grown plant bloomed last year with a thirty foot bloom stalk and produced over 100 pups and seed pods. These plants are very small and are container growable for many years, or are ready to be planted into your landscape if your climate allows. This is a particularly handsome A. americana form with almost smooth edges and very graceful arching leaves.